Japanese mixed martial arts stalwart Yuya “Little Piranha” Wakamatsu was a kid who had too much pent up energy that got him into a lot of trouble. But that changed when a friend introduced him to mixed martial arts. Not long after, Wakamatsu would embark on a journey that would change his life forever. “When I was a kid, I used to get into a lot of trouble,” Wakamatsu said. Wakamatsu grew up in the rural city of Satsumasendai in the Kagoshima Prefecture in Japan where there were limited resources. Mixed martial arts was a term unheard of in this region at the time and in turn, opportunities for him to train were scarce. So in order to pursue a professional career in the sport, the once mischievous child decided to leave his family and moved to Tokyo to pursue his craft. “I was born and raised in Kagoshima which is a very rural place,” Wakamatsu said. Today, Wakamatsu boasts of a 10-3 record with nine knockouts to his name. He is one of the most exciting flyweights to come out of Japan. In fact, he’s been so impressive, that he earned the right to face an absolute legend in his next bout. 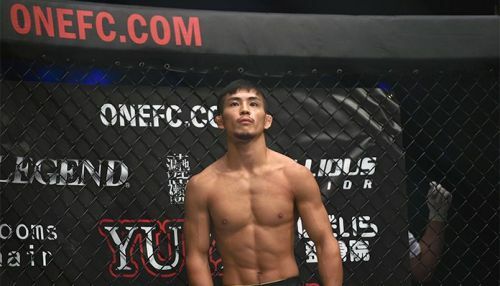 “Little Piranha” will be participating in the eight-man ONE Flyweight World Grand Prix at ONE: A NEW ERA which takes place in Tokyo on 31 March. There, Wakamatsu will be relying on his home court advantage against pound-for-pound great Demetrious “Mighty Mouse” Johnson of the United States. “Since the match against Demetrious Johnson is held in my home country of Japan, I feel that I have the advantage,” Wakamatsu said. After unfortunately succumbing to Danny Kingad in his ONE Championship debut, Wakamatsu plans not to waste this golden opportunity and score what would be a monumental upset over the 12-time Flyweight World Champion Johnson -- a man he holds in high regard. “Demetrious Johnson is the best fighter in the world, and this is a huge chance for a guy like me who does not own World Title belts,” Wakamatsu said. Coming from the rural countryside of Japan, and competing on the biggest global stage of martial arts competition in ONE Championship, in front of his countrymen in Tokyo no less, Wakamatsu can’t help but sit in awe of his situation. Nevertheless, Wakamatsu believes he deserves this match against Johnson and he can’t wait for ONE: A NEW ERA to prove he can hang with the best. “I was just a carpenter in Kagoshima long ago, and now I am going up against a World Champion,” Wakamatsu concluded.